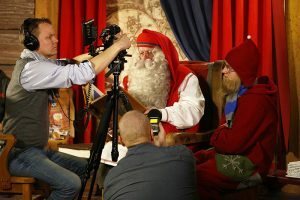 Media is more than welcome to visit Santa Claus in his office, every day of the year. We welcome media representatives to become part of the Christmas fairytale, to share and distribute the good spirit Santa Claus Office embodies. When interested, we are more than happy to provide you with more information of Santa Claus Office. Send us an email and we come back to you as soon as possible. You may also use our pictures for your article. Pictures are found here. Please indicate the source clearly by adding ‘Santa Claus Office, www.santaclausoffice.com’ when publishing. We kindly ask media representatives to contact with inquiries well in advance. Send us more information of the media you represent and the desired date and time, and we organize your meeting with Santa Claus.